Third in the Cogheart saga. Is it a bird? Or maybe a plane? Or – uh-oh. Is the Skycircus a trap? 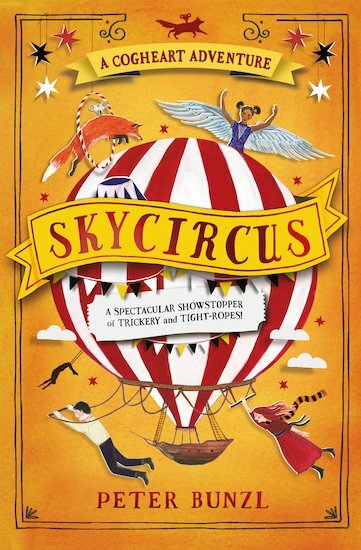 When a floating air-circus arrives, hovering high above Brackenbridge, Lily and Robert can’t wait to step aboard. But there’s something sinister about the hybrid children who appear as part of the act. And before Lily and Robert can figure out what’s going on, they’re captured by shadowy figures. Now they’re being spirited heaven knows where, far through the stormy skies! There will be treachery, tightropes and trickery aboard the mysterious aerial circus. But will there be a chance to escape?